Meet Oreo, she is the momma cat. We got her from a close friend of mine. 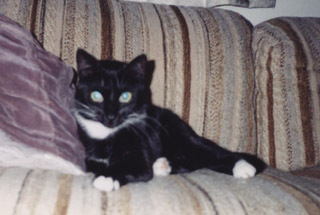 We were told that she was black and white, so Kristen named her Oreo sight unseen. Turns out she has a white strip that runs down her belly. We had a good laugh about that, and I just fell for her. I must say that this is the sweetest most loving cat I have ever seen. She has this cute little way of meowing, almost like a Three Stooges "Nyuk Nyuk!"